We have covered hair transplants, wigs, hair systems, pills and lotions to great length over the years, just when we thought everything that can be discussed has been addressed already, here comes Skalp Micropigmentation, the latest and the most creative in recent years when it comes to hair restoration. Skalp Micropigmentation offers a creative solution to those who are no longer satisfied with conventional hair loss treatments. Gone are the days when you need to rely on drugs, pills, lotions, surgical transplants or wigs to solve your hair loss problems. Skalp offers an affordable and minimally invasive alternative to traditional hair restoration techniques, it can even restore a completely bald head to look like a full head of well-groomed hair in just a few sessions depending on the extent of your hair loss. Skalp™ Micropigmentation (medical hairline tattoo) is the ultimate answer for male and female scalp grooming; an incredible treatment where natural pigments are applied at the epidermal level of the scalp to replicate the natural appearance of real hair follicles or strands – depending on your hair loss extent, and desired look. According to Skalp, their method is regarded as the best treatment of its kind available in the world today, using only natural pigments and application methods. Their practitioners are fully qualified to Diploma standard for permanent cosmetics and micro pigmentation treatments and recognize that your follicles don’t always naturally grow in the same direction, their team will replicate the natural eddies and idiosyncrasies of your hair pattern. They also understand that your hair follicles are not all the same shade, that's why very often 3-4 shades of pigment are used to create the most realistic finish – giving a younger more confident hairline. Micropigmentation is suitable for most types and stages of hair-loss, on all ages, colors and skin types. The follicle/strand build up of Micropigmentation normally takes place over 3 sessions, each taking approx 3-4 hours with at least one week between sessions. The process allows for a very gradual and subtle rejuvenation/infill of the hairline, rarely identified even by close friends and family. Skalp Micropigmentation – During the procedure, a cartridge containing 3 needles working in symphony gently inject natural pigment into the 2nd dermal skin layer. Skalp only uses the latest innovative technology. Pigment spacing is determined by replicating the remaining natural hair follicles. Skalp practitioners have a wealth of experience and their relentless pursuit of perfection will give you the best possible results. Crown balding is one of the most common types of degenerative hair thinning and balding, usually making sufferers look older than their years and affecting self-confidence. Our treatment will rejuvenate the look of the crown, giving a completely realistic hairline and the ease of top-up treatment makes it ideal for the slowly developing crown thinning and balding process. Receding Hairline - Balding men are in general agreement that baldness is a nuisance but they rarely agree on which is worse; crown balding pattern or receding. With Scalp Micropigmentation you don’t need to debate this any further; Scalp Micropigmentation will camouflage wherever your area of concern is, leaving you with a cropped, strong and attractive hairline. Complete Hairloss - Micro Pigmentation is often the ideal solution for clients who have suffered complete hair-loss. We are proud to be part of the solution which we have seen restore self-esteem in all ages of clients. We love that we sometimes hear Scalp Micropigmentation referred to as “sudden hairline gain”! Alopecia Areata - many alopecia areata sufferers come to us to restore their hairline look. Alopecia can vary hugely in severity from one person to the next and the flexible targeted process of Scalp Micropigmentation allows us to help restore self-esteem in many alopecia sufferers. Women Hair Loss - almost 5% of women suffer from hair loss/thinning conditions; we can carry out exactly the same treatment for women who then have the choice of short or longer hair, because even on long hair, the micro pigmented areas will be much less noticeable than the bare scalp previously was. Diffuse Hair Loss - diffuse hair loss can affect both sexes at any age and can be caused by anything that interrupts the normal hair cycle, including emotional stress, nutritional deficiencies, and endocrine imbalances. 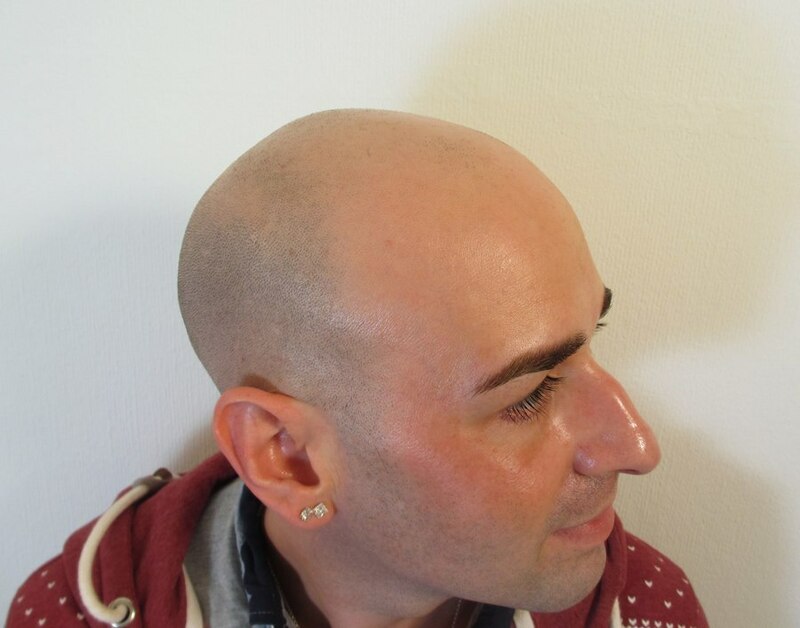 Scalp Micropigmentation can be an incredibly effective solution, restoring confidence and looks. Skin Types - Skalp Micropigmentation is suited to all skin types and colours, White, Afro-Caribbean, Latino, Asian and mixed-race. Our innovative technology matches your follicle colour to provide a seamless, invisible blended match with any existing hair.